Just when you think handwriting is becoming a lost art in today’s society…bam! It appears to be everywhere again. Granted, it’s not the beautiful script penmanship that we all had to learn, but it’s fun nonetheless. I love seeing all the different styles. It’s an eclectic smorgasbord of visual delight. That’s why today’s sale is about all things handwritten. Buy two or more of all things scripted and save 30%! You can find them all HERE. Use code NSDSCRIPT at checkout. And to show it all off in the finest of ways is guest artist, Stephanie Bryan! 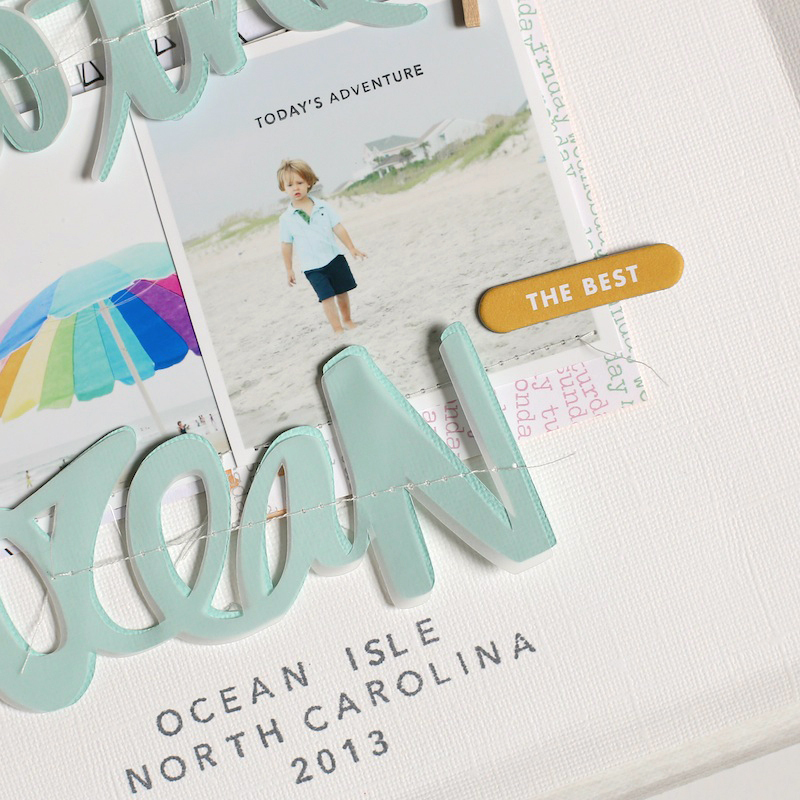 I am in love with the great big dreamy title complemented with the tiny alphabet stamps. Hi there! 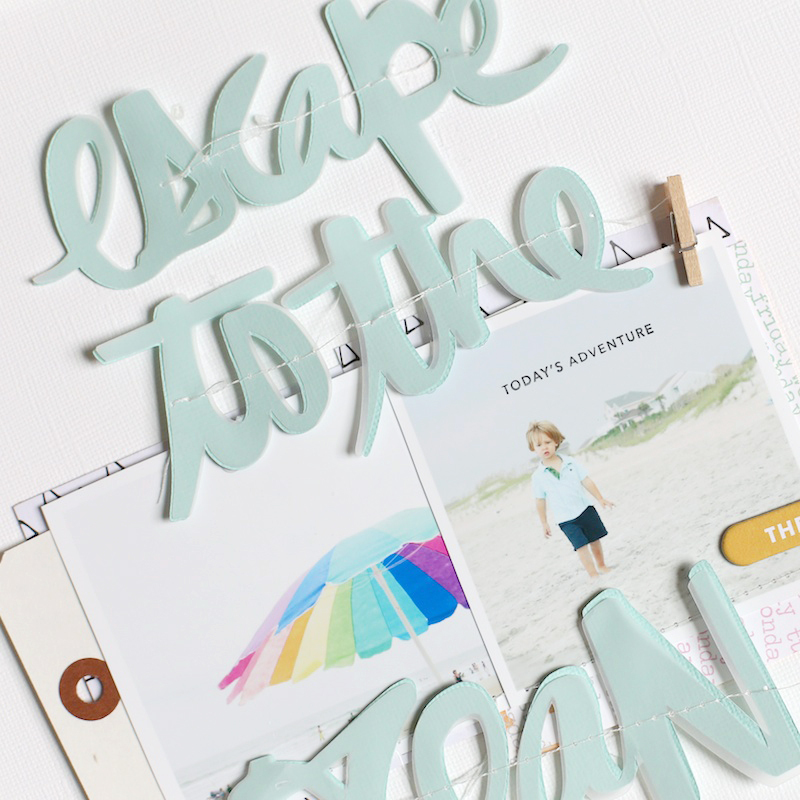 I’m so honored that sweet Kerri asked me to be a guest on her blog for some National Scrapbook week fun! I always love thinking outside of the box and playing around with my supplies and my Silhouette Cameo! 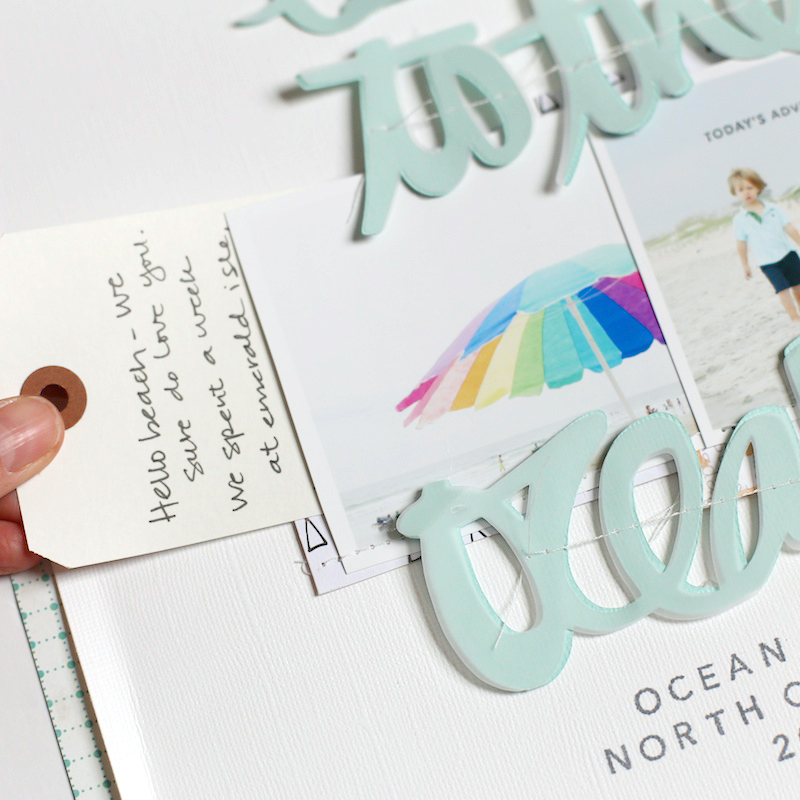 Kerri’s cut files (and handwriting) are my favorite, and now I’m adding her alpha stamps to my list of favorites! 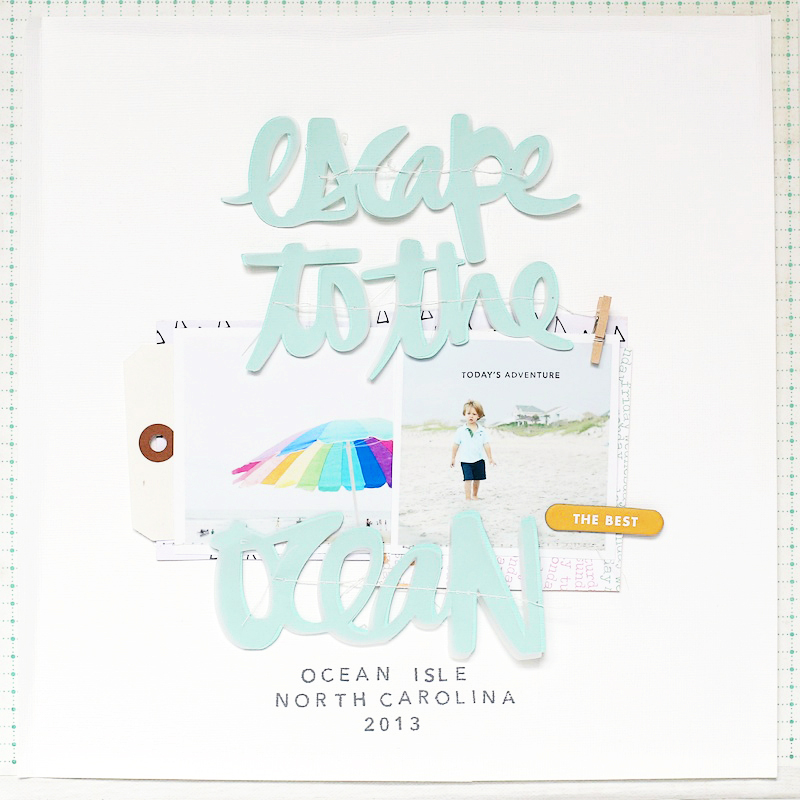 I started my page by cutting out my title “escape to the beach” on aqua card stock and vellum. I decided to layer the two papers together to create a soft, dreamy effect to the title. I broke the title up a little and placed the die cut words around my photo and layers. At the bottom of my page, I stamped the details of the photo (place and date) using the Annie alpha stamps. (These stamps are just the best!) I didn’t have a lot of space left to write my journaling, so sewed a little pocket behind my photos and slipped a journaling tag in the pocket. It’s the perfect place for our beach story. Thanks so much for joining me today, and thanks for having me over, Kerri! We are all just tickled pink that you came to play this week, Stephanie, and share your amazing talent, you cute thing you! And if you are fan of the alphabet stamps that Stephanie used (I love how they look on her page! )…guess what’s on sale tomorrow! And I do believe it is May 1 as well…which means…new stamps for the month! You won’t want to miss tomorrow! Such a beautiful page! Thanks for the fun discount today, too! Adorable! I love the layering and how it looks like its 3D. I’m checking out the new stamps!